Iconic and game-changing, Akira is the definitive anime masterpiece! Katsuhiro Otomo s landmark cyberpunk classic obliterated the boundaries of Japanese animation and forced the world to look into the future. 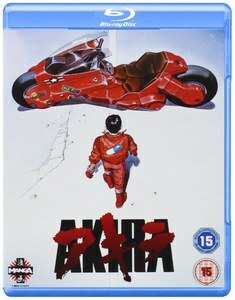 Akira s arrival shattered traditional thinking, creating space for movies like The Matrix to be dreamed into brutal reality. Neo-Tokyo, 2019. The city is being rebuilt post World War III when two high school drop outs, Kaneda and Tetsuo stumble across a secret government project to develop a new weapon - telekinetic humans. After Tetsuo is captured by the military and experimented on, he gains psychic abilities and learns about the existence of the project's most powerful subject, Akira. Both dangerous and destructive, Kaneda must take it upon himself to stop both Tetsuo and Akira before things get out of control and the city is destroyed once again. Special Features: Akira Sound Clip (1988), Music for Akira, Director Interview (subtitled), Storyboard Collection, The Writing on the Wall, Original Trailers (subtitled), Original Commercials (subtitled), Restoring Akira, Glossary, U.S. 2013 Trailer, Trailers.